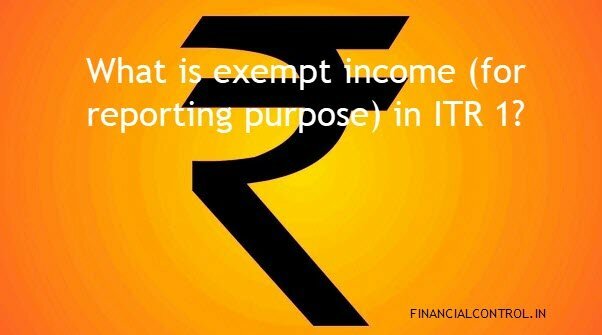 Home » What is exempt income (for reporting purpose) in ITR 1? What is exempt income (for reporting purpose) in ITR 1? Every individual or Hindu undivided family (HUF) are worried about taxable income, some of you are not aware of the exempt income option ITR1 under section 10 which was only (for reporting purpose in ITR 1). In this article, we will understand the objectives of the portion exempt income for reporting purposes. In ITR 1 when you click to “Tax paid and verification portion” You will get except income (for reporting purpose). Before understanding section 10(38) of income tax act, We will understand what is long-Term Capital Gains? Long-term capital gain tax is the tax revenue generate by the Government of India against the profit generation of the investor from the long-term assets. Any investment of more than 12 months is said to be a long-term investment. Under section 10(38), In case of long-term transactions executed on a recognized stock exchange in any International Financial Services Centre (SEZ Act) where executed is in foreign currency, the exemption u/s 10(38) is available even though it is not liable to STT. Also Read: Why to Pay interest u/s 234A, 234B & 234C under Income tax act? According to section 10(34), any income received in the form of a dividend from the domestic company. When you hold a share/stock of the company, you will get the dividend declared by some of the company annually. The amount received by the shareholders from the company against “buyback, merger etc” are not treated as the dividend. Dividend income to the taxpayer from a domestic company is exempt in the hands of the shareholders for a simple reason of avoiding double taxation. Although income from share dividend is exempted, the income discloser is mandatory. Under this portion, it is very clear “if the taxpayer received income <= Rs 5000, it is completely exempted, the discloser is mandatory. There are several other types of income which are exempt u/s 10 of the Income Tax Act which is also mentioned in ITR. The list below deals with income exempted. Some of it is also available in ITR form. Some of the allowances received by the employee are partially taxable you are required to report the exempt portion from these allowances in this portion. Other than that some of the other payment received which comes under exemption nature partially or fully like. If the income received from different sources u/s 10, you only have to press Add button and select the nature of income and insert the amount. This part of the ITR is very important according to the Income-tax department. Any Discloser under this section is non-taxable but hiding any other source of income invites income tax notice. So always be an honest taxpayer and disclose all your payment and its nature. My employer deducted TDS of Rs 23640 . on Salary ( Rs. 449520 ) in FY 2013-14 which I was not got but due to deduction of TDS I was filled ITR indicating gross income of salary which I was not got in that year. This salary I was got in FY 17-18 as arrears . Now I am calming 10E under sec 89 relief . IN 10 E form in column no. 2 I will write zero income . so whether it is correct ? But How I will get return of Tax paid of Rs 23640 in years 2013-14 . First If your employer deducts TDS, they definitely gave you FORM 16 and you also check the payment made in FORM 26AS, and as per your question if you have not received the amount in your bank account, you won’t need to mention the amount as your gross income. You must file your return and then you will get your TDS deducted back (if the employer deposited in your PAN). Secondly, You receive that amount in FY 17-18. In Form 10E you have mentioned your actual amount received in FY 2013-14, in column 3, you have to mention the arrear amount you received in FY 2017-18 of FY 13-14. As far as your tax deduction in the year 2013-14 by your employer. You have to make sure that your employer deposited the amount in your PAN. And you can not revise your ITR for FY 2013-14. You must write to the Tax department.